Developed by physiotherapists, the Clinical Pilates programme pioneered the link between recent spinal stability research and the original work of Joseph Pilates. Core stabilization training and muscle efficiency are key factors that have been identified by researchers and addressed by the Clinical Pilates approach. Athletes too are now focusing on muscle control work. The result is a body that works more efficiently. For more details ask our Chartered Physiotherapists. Our group classes are designed to incorporate the principles of Clinical Pilates into your ongoing physical healthcare. An initial individual assessment with a Chartered Physiotherapist to assess your needs & introduce the basics of Pilates, either as part of your normal treatment or in a specific session. 45-60 minute classes which are all run by instructors trained and experienced in leading Pilates classes of the highest standard. Small class size, with a maximum of 6 participants, to ensure everyone in the class is carrying out the exercise safely and correctly and allowing modification of exercises to accommodate any injury, restriction or difficulty you may have. 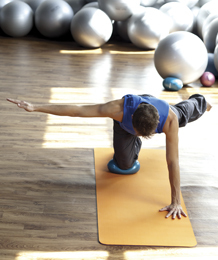 Our Pilates group classes cost €25 per class. Discounts are available if a number of classes are paid for in advance: €60 for three, €120 for seven or €180 for eleven classes. Due to the high demand and to remain fair to all patients, discounted classes booked in advance may not be rescheduled or refunded in case of cancelation. Comfortable clothing is essential, preferably what you normally wear for exercise e.g. tracksuit, shorts, t-shirt. Skirts or dresses are not recommended. Optional items include water bottle, towel and your own mat if preferred. Please remember to switch off your phone before entering your class.